If you have seen a movie called The Prestige (about magic) in the last few years you will be aware that Nikola Tesla, a prominent Serbian-American scientist in the early 20th century, is seen by many as a larger-than-life figure of intrigue and far reaching influence. 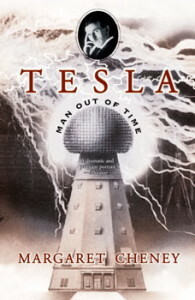 Margaret Cheney’s biography Tesla: Man Out of Time manages to convey some of Tesla’s otherworldliness while still giving a clear picture of his achievements in the real world. Part of her work is to restore Tesla to his rightful place as the inventor of radio, and to clarify his part in the electrical machinations of that time between Edison, Westinghouse and Tesla. She also presents Tesla against the social stage of the time and details his many friendships with celebrities, including Mark Twain. For most of us I think he would not have been a comfortable companion! Tesla’s scientific reach did stretch beyond his practicality . . . or were more practical minds simply not capable of expanding on his ideas? In many cases his ideas were rejected by the military establishment for wartime uses, and yet the US military hierarchies still keep a firm eye on certain of his patents, just in case. So much of his work remained in his imagination, or loosely patented but not developed, that he was never a rich man. It often fell to others to extend his ideas into practical applications and to reap the rewards, so that, at the end, Tesla was somewhat embittered with the scientific establishment. What Cheney manages to convey well is the way in which he was never disillusioned with himself, and never lost his own sense of wonder about the power of electricity. A very balanced portrait of one of the century’s leading minds.